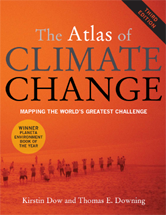 This highly acclaimed atlas distills the vast science of climate change, providing a reliable and insightful guide to this rapidly growing field. Since the 2006 publication of the first edition, climate change has climbed even higher up the global agenda. This new edition reflects the latest developments in research and the impact of climate change, and in current efforts to mitigate and adapt to changes in the worlds weather. 1 Warning Signs The array of extreme events in 2010 stand out among thousands of signs of climate change. 2 Polar Changes Warming in the polar regions is driving large-scale melting of ice that will have both local and global consequences. 3 Shrinking Glaciers Glaciers are losing mass and are in retreat. 4 Ocean Changes Oceans are getting warmer and more acidic, affecting marine life. 5 Everyday Extremes The frequency of some extreme events is increasing. 6 The Greenhouse Effect The intensification of the greenhouse effect is driving changes in the Earth's climate. 7 The Climate System The entire climate system is adjusting to an increase in the heat trapped in the Earth's atmosphere. 8 Interpreting Past Climates Concentrations of CO2 and CH4 are higher than at any time in the last 650,000 years. 9 Forecasting Future Climates Global temperatures are predicted to continue rising. 10 Climate & Social Crises Climate change results from complex interactions in the natural environment, coupled with social and economic changes. 11 Emissions Past & Present Most greenhouse gases have been, and are, emitted to meet the needs of modern industrial societies. 12 Fossil Fuels The emission of greenhouse gases from the burning of fossil fuels is the major cause of climate change. 13 Methane & Other Gases A range of greenhouse gases contribute to climate change. 14 Transport International trade and travel, and dependence on motor vehicles make transport a major source of greenhouse gas emissions. 15 Agriculture Agriculture is a major source of emissions, and vital for economic welfare in many countries. 16 The Carbon Balance Changes in stored carbon are contributing to climate change. 17 Disrupted Ecosystems Many species and ecosystems may not be able to adapt to new climatic conditions and stresses. 18 Water Security Water scarcity has already become a major stress in some regions. Climate change may raise the stress level. 19 Food Security Climate change threatens future agricultural development in some regions, and is benefiting others. 20 Threats to Health The recent increase in the number of victims, and the economic costs of weather-related health effects may be a sign of the future. 21 Rising Sea Levels Thermal expansion of oceans and melting ice will lead to a substantial rise in sea level, threatening many coastal communities. 22 Cities at Risk The combined impact of changes in the climate is falling particularly hard on rapidly growing cities. 23 Cultural Losses Climate change is threatening sites that represent the world's cultural and historical heritage. 24 Urgent Action to Adapt As climate change becomes more marked, the need for adaptation will be ever greater, and more difficult. 25 Building Capacity to Adapt There is a need to develop effective strategies and actions, and to support efforts being made at all levels. 26 City Responses Cities around the world are taking action to reduce their emissions. 27 Renewable Energy Renewable energy sources could be the key to economically and socially sustainable societies. 28 Low Carbon Futures Economic growth needs to be achieved with lower greenhouse gas emissions, especially in developing countries. 29 Counting Carbon Accurate accounting of carbon and greenhouse gas emissions is essential. 30 International Action Most countries have acknowledged the problem of climate change by signing the Convention on Climate Change. 31 Meeting Kyoto Targets Not quite half of Annex I countries are close to meeting their Kyoto commitments. And the agreed targets fall short of what is needed. 32 Looking Beyond Kyoto Negotiations are continuing in the search for a suitable international response in a post-Kyoto world. 33 Trading Carbon Credits Trading carbon credits encourages investment and shares the burden of reducing emissions. 34 Financing the Response Finance for responding to climate change has improved dramatically but is still far from what is required. 35 Personal Action People all over the world are taking measures to reduce the greenhouse gases emitted as a result of the way they live. 36 Public Action The policies, practices, and investments of governments, businesses, and civic organizations will have the greatest impact on our future.